I love doing bead embroidery, but it’s always somewhat frustrating to realize that I can’t really share detailed tutorials with you for how to make them. In the materials list below, I listed all the types of beads that I used, but I didn’t list how many. It’s absolutely impossible to guess how many anyone else will need since it depends upon your personal aesthetic and the size of your central pendant. 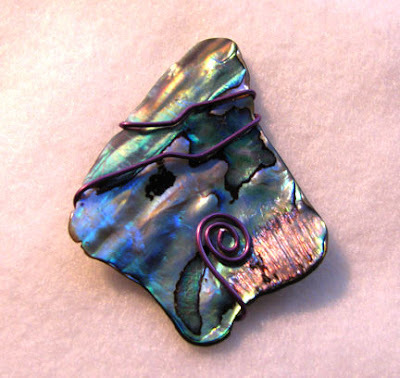 So, pick your piece of paua, and let’s get going! 1. 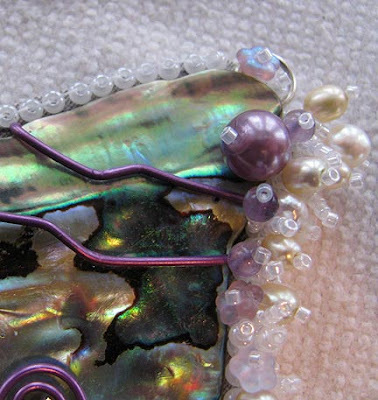 Wrap the paua shell in colored craft wire (sterling silver or gold if you prefer), starting from the bottom. I made a spiral and then wrapped upward, ending my wire in the back near the top. You do not have to anchor the wire at the top; merely cut it off flush. 2. 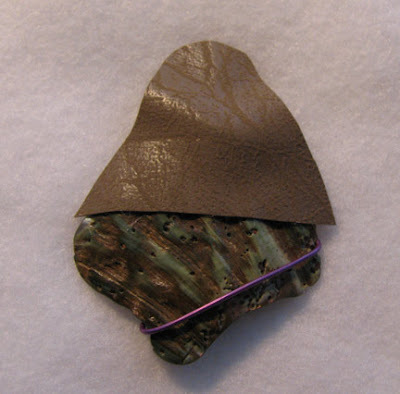 Cut out a piece of ultra suede about 1/8 inch wider than the edges of your shell, and covering only the top half. Smear the back of the shell with epoxy where it will be covered, making sure you cover the cut end of the wire. Let the fabric dry in place. 3. Stitch size 8/0 seed beads along the edge of the ultra suede with the holes pointing up. Stitch one of the silver rings from your S-hook and rings to the top of the ultra suede, tucked under the top of the shell. 4. 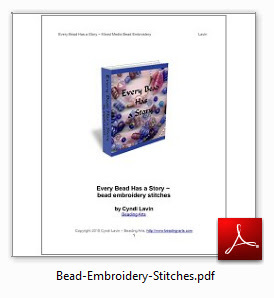 Bring your thread from the back up through each of the seed beads that you've stitched along the edge. Create stacks of size 11/0 seed beads, and stacks that are topped with accent beads like the pearls and Lucite flowers. 5. Cut another piece of ultra suede the same size as the first, and glue it in place over the backing to hide all the threads. Cover the raw edges with seed beads if you wish, and stitch an additional picot stitch between every two beads. This adds a lovely ruffle to the edge and helps to make the embroidered part look fuller. 6. 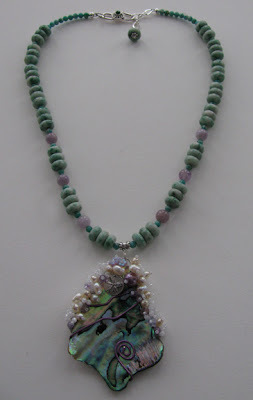 Create a necklace strand using beading wire and the beads of your choice. I made mine a slightly graduated strand, moving from 4mm to 6mm beads. String a slide bail with a loop in the middle of the strand, and finish the ends as shown: using crimps and crimp covers, attach one end to the remaining ring of the S hook set, and attach the other end to the chain. 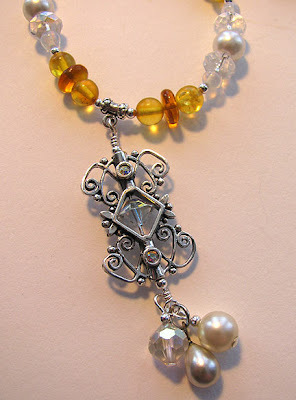 Make a small dangle on a head pin and wrap a loop around the other end of the chain. 7. Use a jump ring to attach the top loop of the pendant to the loop on the bail. For a long time, I have been hoarding some broken strands of beads and some loose crystals that I received when my husband’s beloved grandmother passed away. A few weeks ago, Artbeads.com sent me a gorgeous Victorian Trellis Bead Frame to try out, and the match became obvious in my mind. I really wanted whatever project I did with Grandma’s beads to honor the simple classic style that she favored, and the exquisite details and old-fashioned charm of the bead frame was the answer to using her beads properly. I’ve included my exact bead count below, so if you want to follow my pattern you can. But I would encourage you to simply take the general idea and make your own necklace that honors some of your own special beads! 1. Slide a 4 inch piece of wire through the bead frame and a featured bead. Add a 2mm silver round on each end and turn a wrapped loop. At the top, turn the loop around the loop in the pendant slide. 2. Place several beads on head pins (I used 3). Turn a wrapped loop at each top, 2 of them around the bottom loop of the bead frame wire from step 1. 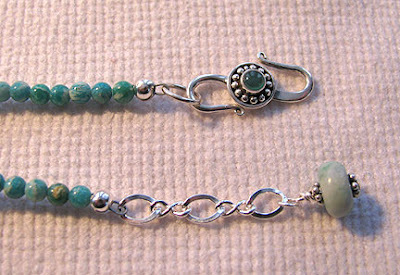 Attach the 3rd beaded dangle to a jump ring, and attach that to the bottom loop of the bead frame. 3. Cut your beading wire to the desired length, and use a crimp and crimp cover to attach one end to half of your clasp. String the first half of your necklace. 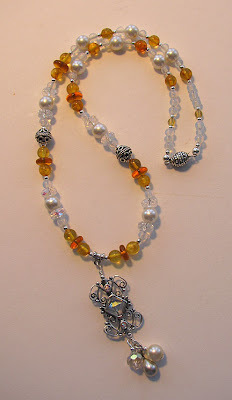 You can follow the pattern I used exactly if you wish, sandwiching each amber cluster and the Bali silver beads between 2mm silver rounds. 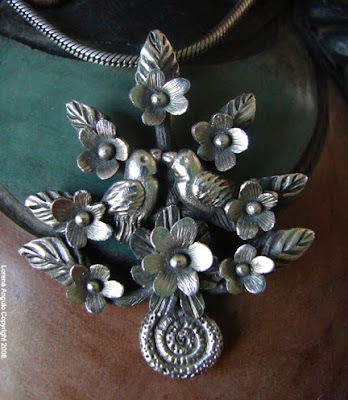 Place another silver round at the end and add the pendant slide with the pendant. 4. Repeat the pattern you've chosen in reverse up the second half of the necklace. End with a crimp bead and crimp cover attached to the other half of the clasp. Lorena, when did you become interested in art? I was born in Mexico, and due to my father’s job in public works we had to frequently move from state to state, what gave me the unique opportunity to grasp the various cultural and artistic expressions of the different regions of Mexico and our Spanish and Indian heritage. That unique experience help me develop my deep love for Art, and to see all the various types of art created by different artisans was amazing. 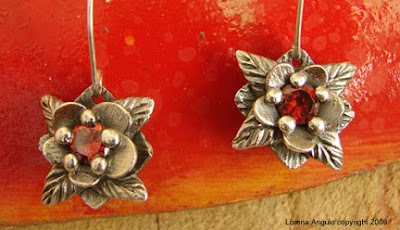 Mostly for me the traditional jewelry wore by the native Indians in South Mexico, Chiapas and Oaxaca, are my favorites. 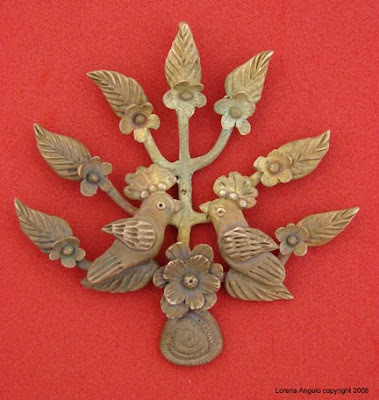 How were you introduced to metal clay? 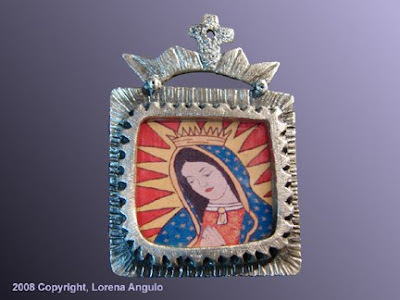 I was introduced to metal clay by a wonderful Artist Jeweler and Teacher in San Antonio, Claire Holliday, in 2006 at the Southwest School of Art. Since that day I fell in love with this great medium. 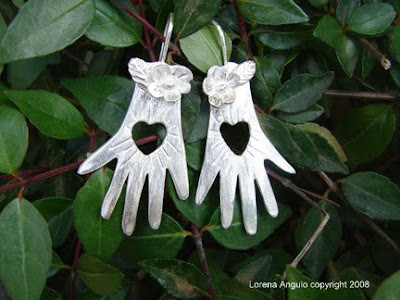 Metal Clay opened the door to a lot of people without silver smithing background to create jewelry. 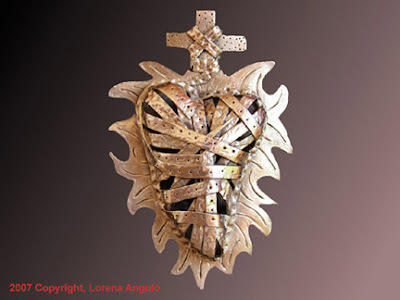 Metal Clay gives me the freedom to create a piece in such a short time, for me that is incredible, it is like magic! How would you describe your art work? 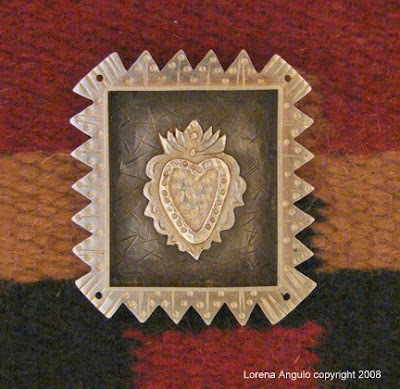 My art work is a one-of-a-kind jewelry that transmits a feeling and a story, mostly influenced by my Mexican heritage. It is simple, but at the same time is full of delicate details that enhance the beauty and uniqueness of the piece. Every piece has its own personality. My work is very artisanal and folk art influenced. Working with Metal Clay (Precious metal clay or Bronze clay) the needle tool is something that I can not live without. Most of my work has a lot of detail that I created using the needle tool. From my cultural heritage and influences from Mexico. I really like to create art that represents my culture and that gives people a story in every piece I make. I’m very influenced by all sources of folk art that express a cultural heritage giving me the opportunity to add “soul” to my work. Would you tell us about your creative process? My first step in creating something is to draw it in my design book as soon as I have an idea. I always carry my book with me because I never know when an idea may pop up. But most of my creating happens in the moment I have the metal clay in my hands. I let my feelings take over and I do not stop until my piece is finished. Sometimes I start with an idea but while working with the metal clay the original idea may be modified, and I end up with a piece totally different than the one I was planning to do. In my case the creative process is very magical and natural. I loved to listen to music while I am working on my studio. The music is usually a mixture of latin american artists, folk Music and english singers ;-}. What has been your favorite project, to date, in your career? person who really appreciates artisanal works and its uniqueness. What certifications/honors have you received? Rio Grande Master Artisan Certification, my work has been featured in the “2008 PMC Guild Annual II , Exceptional work in Precious Metal Clay” book and in the coming book from Barbara Becker Simon, “Metal Clay Beads” that will be publish in April 2009, one of my pieces is going to be on the Gallery section of the book. Knowing that at the end the work will be finish and more beautiful that I ever thought. To not be afraid and enjoy doing what you are doing. Be the best cheerleader of your work. Everything that has been made with your own hands deserves respect and a lot of love and confidence. Since the moment you created something with your hands, you have to consider yourself an artist. Art does not have limits. Reading books and looking for new techniques all the time it is also very important. We need to be open to learn new things and experiment. My two beautiful kids, Christian (10) and Veronica (6), and my awesome husband Jorge who supports my art a lot and has been the best cheerleader of my work. He was the first one to tell me that what I was doing was beautiful and that I needed to promote my work and called myself an artist. I am blessed to have the family I have and very fortunate after all we went through with our beautiful daughter that was born three months early with only 1 Lb 11 oz. She is our miracle baby and the best teacher we all have that perseverance paid off very good at the end. Both my kids are my inspiration to always move forward and enjoy life at its best. What are some of your other favorite things, including your favorite comfort food? The authentic Mexican food takes me to my childhood and I am happy to feed my kids with the same foods I used to eat. I loved the food that my husband makes too!!! He is from Argentina and makes amazing things that our kids enjoyed too. Book: Right now I am reading, “Three cups of tea” by Greg Mortenson & David Oliver Relin. This is for my personal reading ;-} I love to read anything but lately I have been buying a lot of technique and workshop books relate it to silversmithing, jewelry making, enameling, Precious Metal Clay, Resin, Mixed media jewelry and I am waiting for the first book about Bronzclay ;-}. Color: I am a rainbow person. I Like all the colors of the rainbow ;-} and if they are bright better for me. Other hobbies: I make Folk Art and metal embossed pieces.